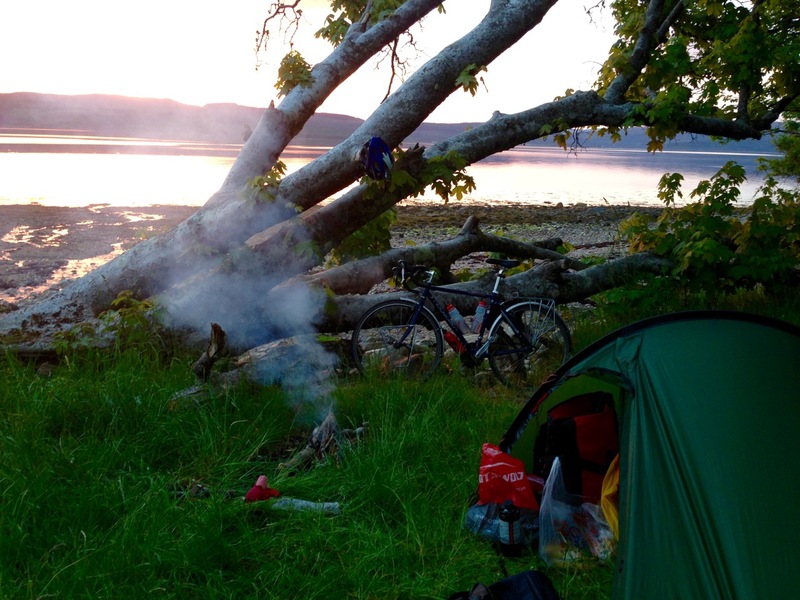 At the beginning of July I headed up to Scotland on the sleeper train from London to Glasgow, to ride some of the Wild About Argyll bike packing trail from Helensburgh to Oban. It’s a route I’ve been pondering for a while, and perfect to put my new Trek 1120 through its paces. I thoroughly recommend the sleeper train for getting up to Scotland. A quick trip on the train down from Norwich, then fall asleep after a meal out in the big smoke, to wake up Glasgow. A courier picked up our bikes in London as there wasn’t room on the train for the trip up, but it was at no extra cost and we collected them from just outside Glasgow station upon our arrival. Judging from the courier’s agenda the bikes had an interesting journey up north, accompanying coffins! From Glasgow we hopped on a local train up to Helensburgh where the Wild About Argyll Trail (#waat) starts, although we nearly didn’t get off at the right station due to being confused about Helensburgh Upper versus Helensburgh Central; we had to disembark rather rapidly under the critical eye of the train guard. I usually go on tour on my own, however this time my friend Ian came with me; he has far more mountain biking experiencing than me, so I was hoping to pick up some tips! I was slightly nervous about navigating off-road, as well as negotiating some of the trails, so handy to have someone else along to share the ride. Here are links to our routes on Strava, for interested readers. 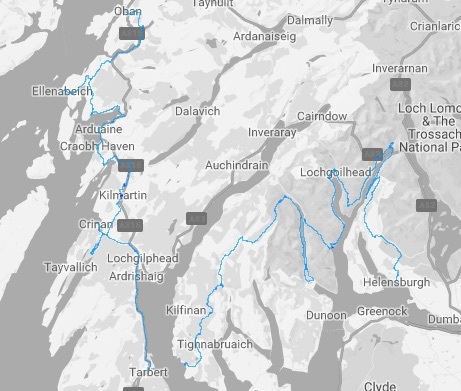 Due to time constraints we didn’t complete all of the Wild About Argyll Trail, cutting out a few sections such as the loop around Dunoon and Kilberry, but we added on a trip to the Knapdale Forest Beaver trial, and had a very enjoyable and very much flatter ride alongside the Crinan canal. Here’s a picture sketching out complete route. We decided not to take any camping stoves and cooking equipment with us, opting instead for cold food and pub meals along the way; this proved to be a wise choice and lightened the load. Instead of bivvying we took tents, fearful of the midges; this also proved to be a wise choice. The midges were less of a nuisance than they have been on my previous bike trips to Scotland, but still voracious, as were the ‘Cleggs’, which we were warned about by a local and later learned are horseflies. The Cleggs landed a few bites, especially on long climbs when you don’t notice them landing on your legs till they bite you…ouch. The scenery throughout the trail was pretty breathtaking, mixing forest and moorland, following the coast and cutting up over large hills, before plummeting down to small towns and villages. I don’t think I’ve ever experienced weather in Scotland quite like it. 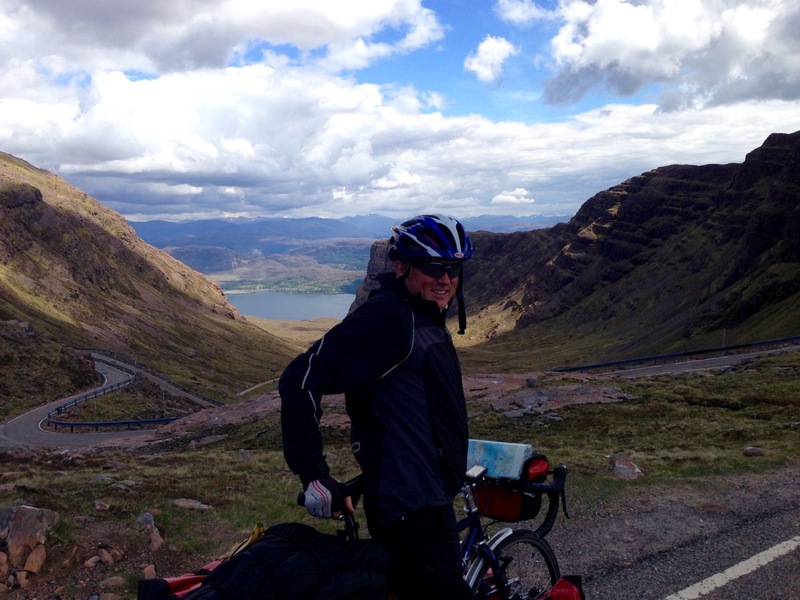 In 2013, in a similar area whilst cycling round the coast of Britain, I experienced about a week of horizontal rain. We only had about half a day’s worth of intermittent showers, and sunshine for the rest of the time. One of the challenges started to be finding enough water to drink it was so hot, especially after a long climb. I carried three water bottles on my bike, having installed an extra cage just before the trip, and it was just about enough to keep me going between stops. Luckily there are cafes and pubs to refill at, as well as the occasionally outdoor tap courtesy of friendly locals. We stopped for a pint at the Goil Inn after a very exciting downhill section, during which I’d had to quickly learn the art of dodging crash inducing pebbles and boulders, and how to balance the bike round steep corners. Flat stones on top of other stones really don’t do you any favours at high-speed, although the oversized tyres on my Trek 1120 gave me welcomed extra traction. I loved the trails that sweep down off the hills onto hard-baked earthen trails underneath the trees, banking round corners and getting a run up to the next climb. Such a contrast to the Norfolk countryside. We camped next to the seashore in Ardentinny on the first night, literally riding into an excellent spot we had no idea was there. The only slightly disconcerting sight was that of Coulport across the waters, the storage and loading facility for the UK’s Trident programme. The following day we road up over the pass to the Whistlefield Inn, a steep climb for first thing in the morning, before descending at high speed down to Loch Eck. We passed Puck’s Glen but didn’t climb up to visit it, having taken a slightly wrong turning earlier on; somewhere to go back to when I’m next up that way. After a very decent bacon sandwich at Sheila’s Diner near Rashfield we took the trail up the other side of Loch Eck, before cutting up over the hills, then down the hills, then up some more hills, before finally making it to Portavadie. Navigating was slightly tricky on some parts of this, however we could fall back on the GPX coordinates on Ian’s phone when the ordnance survey map got confusing. The cycling on this section was hard going but worth it. Some really long climbs and remote forestry sections where we were on our own aside from flocks of sheep and the occasional deer. The only downside was sometimes the surface was a little too rough to go down at speed, due to the quantity of loose stones that had been put down for the forestry trucks. We wild camped next to Portavadie after enjoying a cold beer or two in the marina; we might have looked slightly scruffy but it was very pleasant sitting outside looking at the boats. Sunday morning saw us take the ferry over to Tarbert, where we enjoyed a Scottish fry up and restocked on a few supplies before heading North to the Crinan canal. Our legs were feeling somewhat tired after an intense first two days, so we decided on an easier day, taking in the Crinan Canal and Knapdale Forest Beaver Trial. From Crinan we rode North to Kilmartin, following the valley and stopping to look at the cairns, burial mounds and standing stones. We had a wee dram of whisky and poured a libation for for the spirits, just to be on the safe side. There’s a good pub in Kilmartin, a perfect stopping point for a meal before finding somewhere to camp. The churchyard is also well worth a look, being full of old gravestones, some of which are carved into semblances of armoured men and swords. Ian found what are probably a few ancestors buried in there. We weren’t entirely sure where we were going to camp but found Carnasserie Castle a few kilometres up the trail, which made for another excellent stopover. It was nice relaxing on the battlements, away from the midges, enjoying the views back down the valley and imagining what it was like centuries ago. With the sun out again we decided to push for Oban on Monday, to allow for a day off on Tuesday before heading back down South. I was in more familiar territory now having holidayed up here several times over the years, but never quite in this weather. From Carnasserie Castle we pedalled to Ardfern, before cutting up and over the trail to Craobh Haven, then round to Kilmelford. 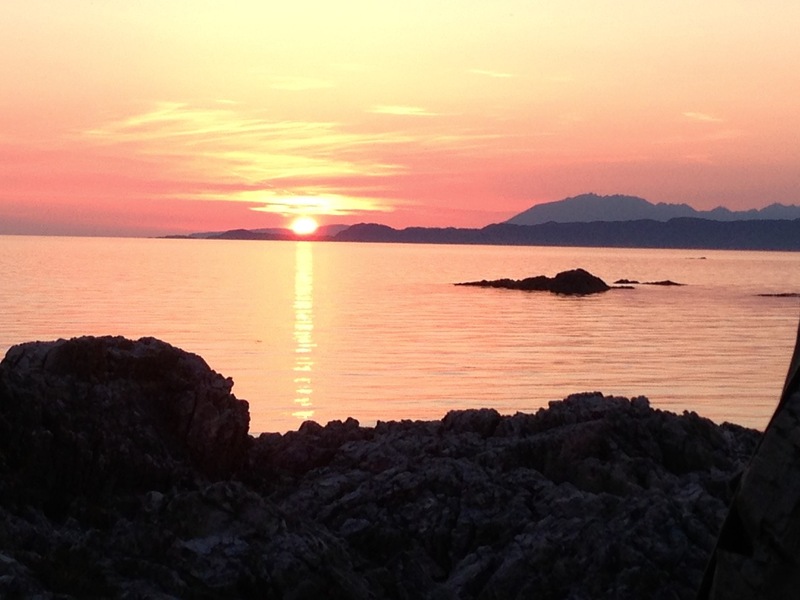 The route then takes you alongside Loch Melfort to Degnish, where you take the trail over towards Seil Island. We diverted from the Wild About Argyll Trail at this point, over the Bridge over the Atlantic, to explore the island and Easdale. The route from Easdale to Oban involved a bit of road, before we were able to skirt inland and round the back through forest, before descending into the port. We passed a series of curious wooden fellas on the latter part of our journey. We stayed in a very reasonable hostel on our last night, before exploring Kerrera Island on foot the following day. There’s a ferry from Oban to Kerrera, and a good walk round the island – think was about 15 km, with an excellent eco type cafe to visit at the other end of the island. After 4 days on the bike, and a saddle I’m not used to, it was very pleasant to have a walk instead of pedalling. After chilling out all day we picked up our bikes from the hostel and caught the train from Oban to Glasgow; a very scenic journey, during which the heavens opened and it rained – excellent timing. Then it was a simple matter of cycling the short distance across Glasgow to get the sleeper train back to London, with a side trek for a quick pint. I had time for a quick pedal round London in the morning, before getting the train back up to Norwich. The cycle highways on London are excellent! Overall my Trek 1120 was a pleasure to ride, performing excellently off-road, and with ample room for packing kit in the innovative rack system. I need to tweak a couple of spokes to fix a slight wheel buckle, but aside from that nothing broke. The seat dropper post is a great feature, giving you excellent stability when you need it, however I’m going to have to get the next size up for a more comfortable ride, due to my long legs, and I might replace the saddle with a Brooks Cambium or similar. I was slightly worried the oversized tyres would lead to too much rolling resistance, however with the bigger wheels this didn’t prove to be an issue, and it was definitely a lot of fun bouncing round the Scottish hills; it goes over anything, hence a friend christening it ‘The Tractor’ rather than ‘The Beast’, which was my first choice. Looking forward to taking it on more back packing adventures soon. This entry was posted in Bike packing, Scotland, Self Propelled 2018 and tagged Adventure, Argyll, Bicycle Touring, Bike packing, Countryside, Cycle Touring, Expedition, Glasgow, Kerrera Island, Oban, Scotland, Self Propelled 2018, Trek 1120, Wild About Argyll Trail on July 31, 2018 by SelfPropelled. Recently I’ve been pondering the terms ‘growth’, and ‘progress’, when they’re used to describe our aspirations as a race, in the developed ‘Western’ world anyway. 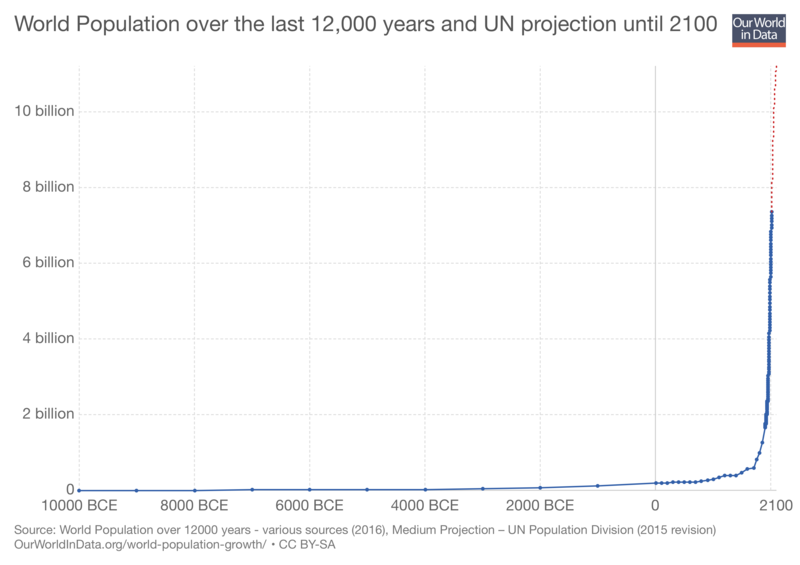 It’s weird how we seem to think of progress and growth as building more, and consuming more of our finite resources. Is that really progress? It doesn’t seem to make that many people more content with their lot, or healthier, mentally or physically. If anything it just seems to create more problems. 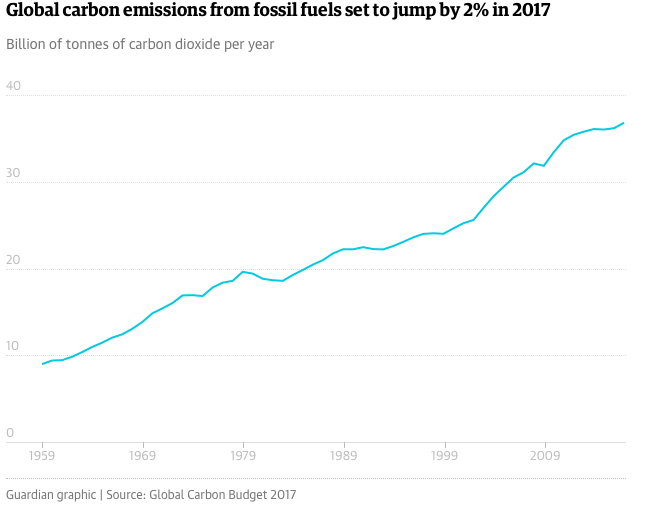 We always have to pursue economic growth, but surely infinite economic growth is impossible when you have finite resources, and an economy that is based on using them. I think a different model is needed if we’re to really progress and grow as a species. I’ll write a more structured blog on this in the near future. I might include some thoughts on the new Norwich Northern Distributor road, which as far as I can tell is just there to open up the countryside to more development, more ‘growth’. It’ll mean the closure of at least two of the roads I cycle down to get to and from work, which will no doubt mean more traffic channelled on to fewer roads, with more drivers getting annoyed with ‘bloody cyclists’. I’ve tried to find out some more information about new cycle paths the council might have planned to help cyclists get into Norwich safely, but haven’t found anything concrete yet. I fear I may have to pedal a slightly longer and more congested route, but will reserve judgement pending further investigations. 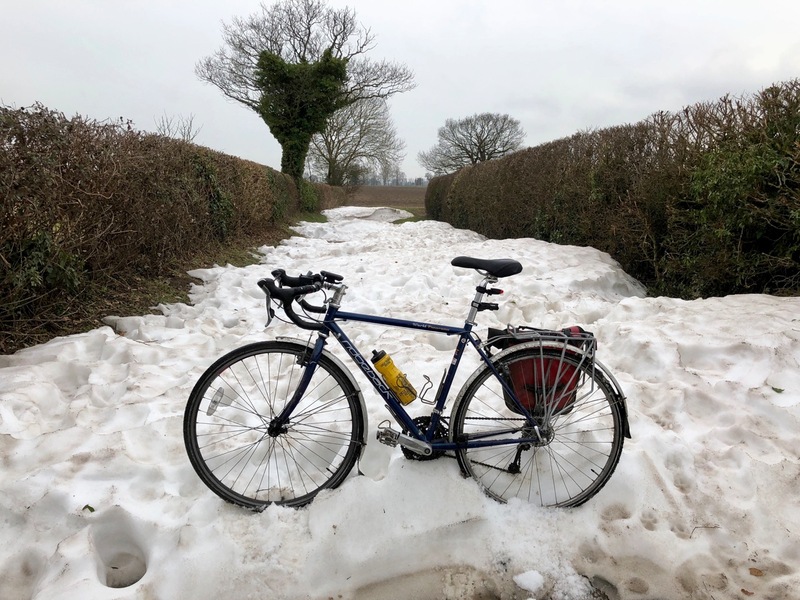 Rather than saying any more on the subject now, I thought I’d share a few photos from my January cycling, either from the commute, or the occasional excursion in search of pie and cake. 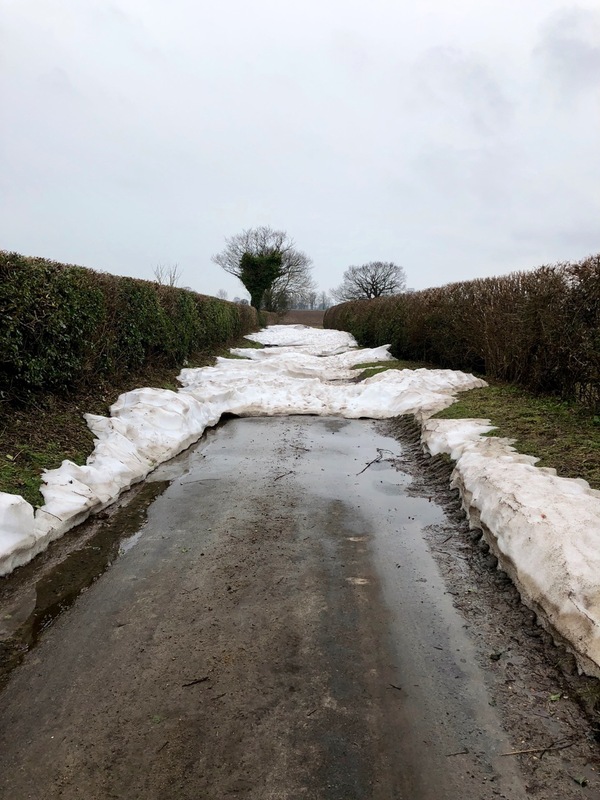 A lot of people seem reluctant to get out during the winter months, however with the right kit it’s absolutely fine, and often more peaceful on the quieter roads. One just has to stay alert for any icy patches; might have done a couple of inadvertent stunts recently. Red sky in the morning, shepherds warning? It’s great seeing the countryside change throughout the year. The tree branches are bare at the moment, but will soon start to bud, shutting away secrets that are currently in plain site. 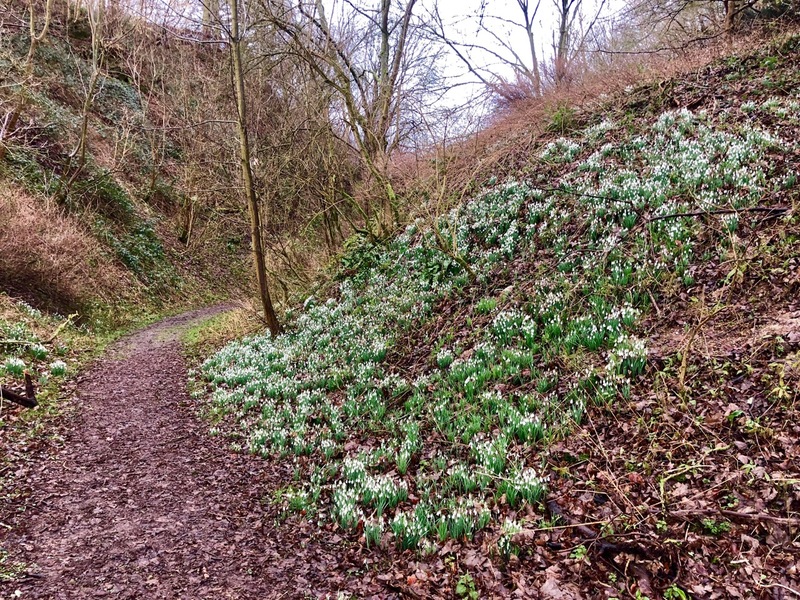 And it’s time for snowdrops to appear in abundance. Lots of them on my route to work. I’m looking forward to seeing the bluebells once Spring arrives. I pedalled home from work illuminated by the light from the blue super-moon the other day, an impressive site. My new camera phone took surprisingly good pics of it; I can use one of these for a cover on one of my short stories. I’ve set a target of 5,000 miles (8,000km) cycling this year, which should be possible seeing as I regularly pedal 100 miles a week just on the commute. I’ll probably go for another tour in the summer or autumn for a couple of weeks, perhaps heading up to Derbyshire and over to Wales; route to be confirmed, maybe Europe instead. In the meantime I’ve been getting out at the weekend a bit, most recently up to Holt to grab a pasty and cake from Byfords. Bywords is a must visit for any hungry cyclist in the area. My route from Salhouse across to Holt was on very quiet country roads, taking in the now closed RAF Coltishall, somewhere I don’t think I’ve been since I was a few months old (felt quite weird). It has rained an awful lot recently, meaning many of the roads have large puddles, or lakes as was the case below. I took the plunge and managed to forge through to the other side, about 30 metres away, without sinking into a pothole. Just how far does the ‘puddle’ go on for? I think I might have to create an album of the churches I pass whilst out on my bike. I’m not particularly religious, but do like churches; their architecture and the often peaceful atmosphere surrounding them is attractive. These two are close to where I live, although there are dozens more, a legacy of Norfolk’s rich farming past and all the landowners competing via the medium of church building. To close, here are a few cartoons I came across recently and thought were spot on, courtesy of @cartoonralph (you can follow them on Twitter). 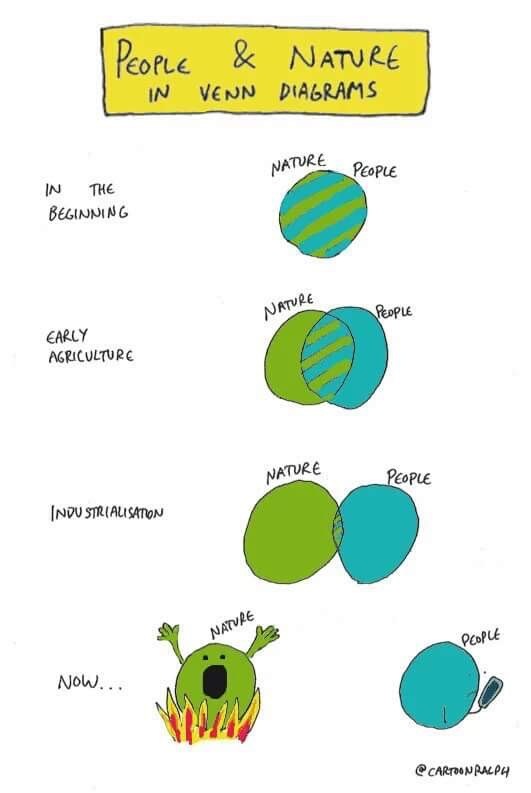 I think they accurately portray how disconnected we’ve become from nature, when we should be part of it, not set ourselves aside or above (there’s a blog to be done on deep ecology at some point too). The centre of the universe one is too true when it comes to our sense of entitlement as a race. Enjoy the winter months and keep on pedalling! 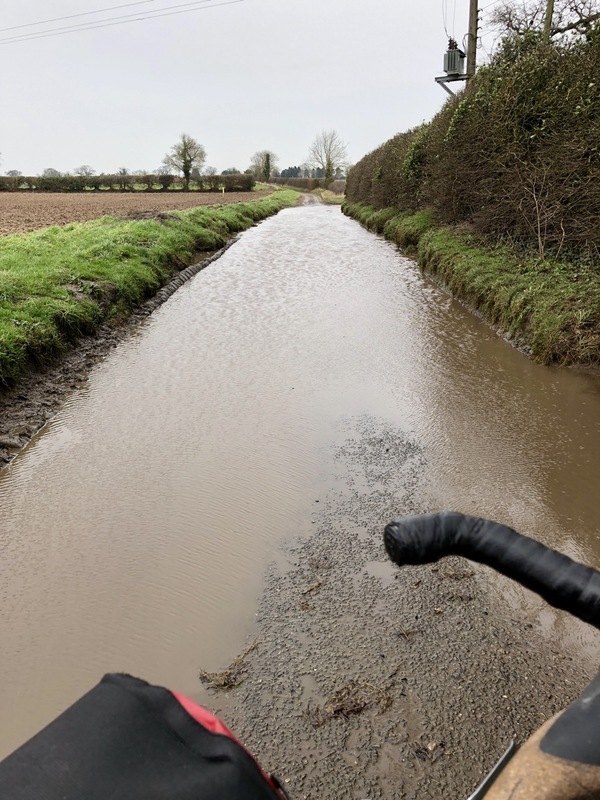 This entry was posted in Fun stuff, Salhouse, Self Propelled 2018, UK and tagged Adventure, Countryside, Cycle to work, Cycle Touring, Norfolk, Northern Distributor Road, Norwich, photos, Salhouse, Self Propelled 2018, UK on February 6, 2018 by SelfPropelled.